Jess discovered the amazing healing power of yoga after a dance related knee injury sent her to physical therapy and yoga classes. Her experience led her to fall in love with the practice, and her natural compassion for others led her on a journey to be able to help others recover from their own injuries and discover their body's full potential. Every single class is a mindful journey through her extensive knowledge of human physiology and energetic flow. Whether it's a restorative gentle yoga class, an energetic and invigorating mid day refresher, or if you're lucky enough to have her in a private practice, you will absolutely be ignited by her passion, humbled by her knowledge, and transformed by her energy. 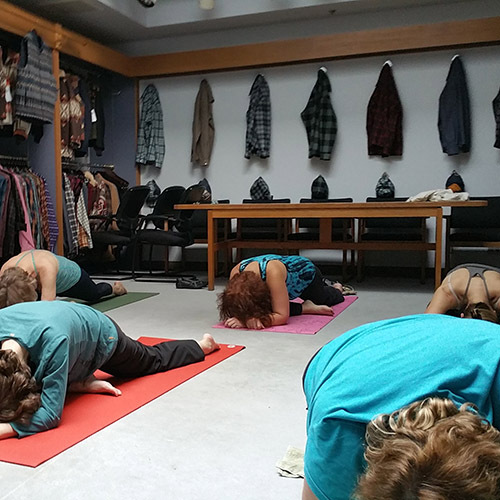 In this Gentle Yoga Class, we take time to connect to our body's at the beginning of class with a guided meditation. We then introduce the breath work and the body movements to help bring that energy deep into our muscles, bones and tissues. 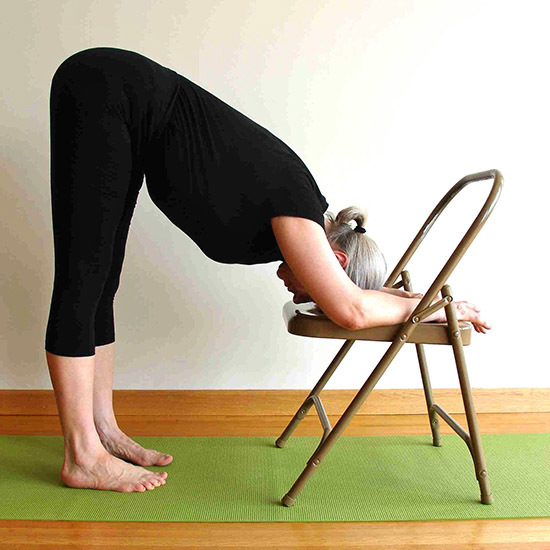 We often will use props (chairs, yoga blocks, pillows, bolsters, straps, etc) to modify postures and each pose is offered with many variations to make it accessible to you, regardless of any limitations your body may be experiencing during that practice. Class is held most Mondays and Fridays from 10-11:15 a.m. Class is held at The Aloha Grange - 3425 SW 185th Ave, Beaverton, OR 97006. Bring Yoga to YOUR workplace! There is quite a bit of evidence mounting that Yoga increases productivity in the work place. Here are a few great articles to help convince your HR Manager to get Jess into your office! Let's get down to the business and break down how to get this to be a reality. We offer two typical programs to bring yoga into your business, and we are open to discussing a custom solution that works for you. Company Sponsored: The business contracts us to teach one or more yoga classes a week, paid by the company. Our current rate is $115/hour (one hour minimum). Company Hosted: The business simply provides the space and a minimum base rate per class, and the students then pay a subsidized rate for each class they attend. Each business is different, so we'll work out the specifics together to provide this amazing wellness experience for your company. To get it started, either talk to the Human Resources person at your work, or send us an email to edge@edgemovementarts.com with their contact information and we'll get practicing at your wor4! Are you ready to accelerate your practice? Whether you're just beginning or you've been practicing for years, under the guidance of a knowledgable, skillful practicioner you can begin to realize truly amazing results in your body. If you're trying to increase your flexibility, gain additional core strength and power, or wanting to develop your hand balancing practice... inviting the wisdom and compassion that Jess brings will absolutely get you to your dreams! It can be difficult to explain what Thai Yoga Therapy is in a way that captures how amazing the experience will be for you. Similar to massage, but so much more, it is like yoga being done to your body. All of the benefits of a full yoga practice are yours with none of the effort! 503-567-9961 and schedule your private yoga, or Thai Yoga session today! Since starting to practice gentle yoga, I have worked with several teachers. For me, Jessica is the best. She has a gentle and loving spirit, and during each practice she focuses on the individual needs of the students. With her guidance, my flexibility, balance and posture have improved. Each practice is a special time to focus on my breathing and the energy in my body. She ends each session with guided imagery to focus my mind on pleasant thoughts and relaxation. I definitely recommend her yoga practice. Jessica's Gentle Yoga is a wonderful and fun way to increase your flexibility, strength and balance. No intimidation involved! Jessica goes above and beyond to ensure all students have options for movements and poses. I feel so fortunate to have her as part of my 'yogi' life. Going to Gentle Yoga with Jessica is a wonderful gift to give yourself. She makes yoga approachable with simple, easy follow prompts throughout the class. Following her instructions to "reach a little more this way" really makes a difference in how you will feel at the end of the class... centered, aligned, taller and just generally better all over. Highly recommended - the most effective "stretching" I have ever done. We are fortunate to have Jessica Lindsey to guide our developing yoga practice. We benefit, both physically and mentally, from her instruction; and we credit her with our ability to enjoy an active senior lifestyle. Jessica provides an excellent yoga program to build strength and flexibility through her classes. It feels great to experience confidence in poses that were difficult just a few months ago. Jessica is skilled at making adjustments in her class program to accommodate age-related issues, injuries, and new aches and pains related to over-indulging in hobbies or home/yard improvements. We both look forward to our yoga classes with Jessica. Not only is she an amazing yoga instructor, but she has facilitated a wonderful collegial atmosphere in her classes where we can enjoy and learn from each other. - Richard & Donna F.